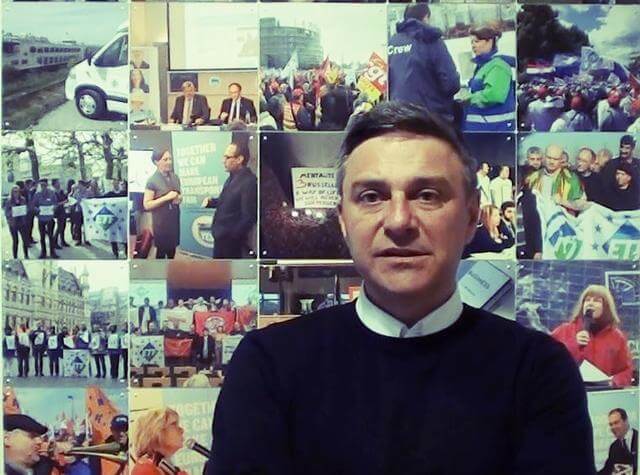 Giorgio Tuti, President of the Transport Personnel’s Trade Union, SEV, Switzerland was unanimously elected by the ETF Railway Section members when meeting in Brussels on 9 March 2017 as its President. The ETF Railway Section brings together 83 railway trade unions from 37 European Countries that represent more than 850,000 workers in the sector. Giorgio Tuti is replacing Guy Grievelding, FNCTTFEL, Luxembourg, former President of the ETF Railway Section since his first mandate that started in March 2009. The steering committee and section members thanked Guy Greivelding for his successful work and continuous engagement for the ETF Railway Section. “Now the 4th Railway Package is fully adopted, the ETF Railway Section has clearly to work on its local implementation in order to continue the fight to protect of railway staff in cases of competitive tendering, and to ensure a high level of safety and security for both passengers and workers. Also, the European social dialogue is stagnating. Consequently I consider as a second challenge the need to expand and boost our activities as social partner”, said the newly elected President in his first statement. As Vice Presidents were elected Maria Cristina Marzola, FILT-CGIL, Italy and Róbert Zlati, VSZ, Hungary. Furthermore, the ETF railway section members elected its Steering Committee and adopted its work program 2017-2021 prior to the ETF 2017 Congress that takes place from 24-26 May in Barcelona, Spain. As first priority, fighting social dumping in railways, a liberalised European sector, remains one of the crucial angle of the Fair Transport Campaign implementation for the railway sector.